What constitutes a successful retirement for you? What do you want your life to be like when you’re retired? If you are approaching retirement, or already there, do you have a dream about what lies Over the Rainbow? Can you visualize what a typical retirement day would look like? Retirement represents one of life’s most challenging transitions. In your retirement planning, you may wonder if you have the resources you need for the new situation. The Wizard of OZ reminds you that sometimes you need look no further than your own backyard. You already have the resources you need for a successful retirement, or you can get them. When most people look ahead to their retirement, they usually ponder how they can have a, happy and successful retirement, and whether they will be able to afford it. Retirement planning is not only about retirement financial planning. If you came to me looking for directions to the Emerald City, and I told you to follow the Yellow Brick Road, you would know that you were off to see the Wizard, the wonderful Wizard of OZ! And soon we might talk of the memorable characters you would meet along the way. 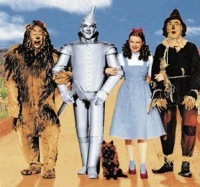 Dorothy and Toto (‘Toto, I've a feeling we’re not in Kansas anymore.’) The brainless Scarecrow, the heartless Tin Man and the cowardly Lion, the Wicked Witch of the West, the Good Witch of the North and the Wonderful Wizard of OZ. And you won’t forget the shy, friendly Munchkins or the evil Winged Monkeys. Well, I’m no Wizard, though I do live in the Emerald Isle and I would like to tell you why I have included this story on my website - apart from the fact that it is one of my favorite stories. And so I dedicate the sentiments in this story to all Retirees who are Young at Heart. 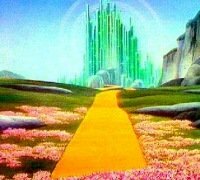 We know, that like Dorothy, you will meet obstacles along the way to your heart’s desire... retirement financial planning, retirement lifestyle planning, best retirement locations, and you may wonder if you need a ‘Retirement Wizard’ (retirement coaching). If you decide coaching is for you, make sure that the man behind the curtain is authentic! When Dorothy and her three companions finally got to meet the Wizard - after a perilous journey - he promised that he would grant their wishes, but with one condition - they must first perform a task to test for the qualities that they believed they lacked. The Scarecrow didn’t have a brain, the Tin Man didn’t have a heart, the Lion lacked courage, and Dorothy didn’t know that her magic ruby slippers could get her home to Kansas. He tasked them to bring back the broomstick of the Wicked Witch of the West. They set out through the Haunted Forest. Dorothy is captured by the army of bluish ugly winged monkeys and brought to the Witch’s castle, where she feels in great danger. 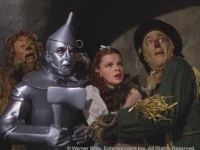 During the successful rescue attempt, the Scarecrow, Tin Man and Lion each display the qualities they seek -ingenuity, compassion and courage. The Wizard turned out to be an ordinary man - an impostor! He couldn't give them brains, compassion and courage, but he could help them change their self-limiting beliefs. He set them a task to demonstrate to themselves that they already had the resources they needed. The antagonist was not the wicked witch with her winged monkeys and spells, but the forces within their own minds. In raising their self awareness, the Wizard changed their beliefs and changed their lives. If you are approaching retirement, or already there, do you have a dream about what lies Over the Rainbow? Is there something about yourself that you want to change or improve? And the kindly philosophy referred to in the opening title? ‘Well, I think that it wasn’t enough just to want to see Uncle Henry and Auntie EM, and if I ever go looking for my heart’s desire again, I won’t look any further than my own backyard because, if it isn’t there, I never really lost it to begin.’ with. Is that right? If you enjoyed this story. Please share your Retirement Stories and Anecdotes! Everyone loves a great story. Stay in touch and subscribe to my monthly email newsletter, Retirement Stories. It contains new stories and tips on planning for and enjoying an active retirement.